The capital of the province of Saxony is a reborn baroque masterpiece sitting on a wide sweep of the Elbe River. Although almost completely destroyed in February 1945, Dresden is working with German thoroughness to recapture the city’s reputation as “the Florence on the Elbe.” Its yellow and pale-green facades are enormously appealing, and their mere presence is even more overwhelming when you compare what you see today with photographs of Dresden from February 1945, after an Allied bombing raid destroyed the city overnight. Dresden was the capital of Saxony as early as the 15th century, although most of its architectural masterpieces date from the 18th century and the reigns of Augustus the Strong and his son, Frederick Augustus II. Though some parts of the city center still look as if they’re stuck halfway between demolition and construction, the present city is an enormous tribute to the Dresdeners’ skills and dedication. The resemblance of today’s riverside to Dresden cityscapes painted by Canaletto in the mid-1700s is remarkable. Unfortunately, the war-inflicted gaps in the urban landscape in other parts of the city are too big to be closed anytime soon. 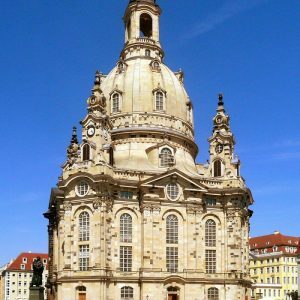 While each guide does each tour differently, there are standard sites that are generally always included in a visit to Dresden. The itinerary can always be changed based on your own preferences, so please always discuss these things prior to your tour with your guide. The order in which the sites are shown are also always different based on the starting point which you have agreed upon with your guide. Frauenkirche (Church of Our Lady). Dresden’s Church of Our Lady, completed in 1743, was one of the masterpieces of baroque church architecture. On February 15, 1945, two days after the bombing of Dresden, the burned-out shell of the magnificent Stone Bell collapsed. For the following five decades the remains of the church, a pile of rubble, remained a gripping memorial to the horrors of war. In the early 1990s a citizens’ initiative, joined by the Lutheran Church of Saxony and the city of Dresden, decided to rebuild the church using the original stones. Residenzschloss (Royal Palace). Restoration work is still under way behind the Renaissance facade of this former royal palace, much of which was built between 1709 and 1722. Some of the finished rooms in the Georgenbau (Count George Wing) hold historical exhibits, among them an excellent one on the reconstruction of the palace itself. The palace’s main gateway, the Georgentor, has an enormous statue of the fully armed Saxon count GeorgeThe palace’s old Hausmannsturm (Hausmann Tower) offers a wonderful view of the city and the Elbe River. Zwinger (Bailey). Dresden’s magnificent baroque showpiece is entered by way of the mighty Kronentor (Crown Gate). Augustus the Strong hired a small army of artists and artisans to create a “pleasure ground” worthy of the Saxon court on the site of the former bailey, part of the city fortifications. Johanneum. At one time the royal stables, this 16th-century building now houses the Verkehrsmuseum (Transportation Museum), a collection of historic conveyances, including vintage automobiles and engines. Augustusbrücke (Augustus Bridge). This bridge, which spans the river in front of the Katholische Hofkirche, is the reconstruction of a 17th-century baroque bridge blown up by the SS shortly before the end of World War II. Japanisches Palais (Japanese Palace). This baroque palace was built in 1715–33 to hold Augustus the Strong’s collection of fine china. Kreuzkirche (Cross Church). Soaring high above the Altmarkt, the richly decorated tower of the baroque Kreuzkirche dates back to 1792. Pfund’s Molkerei (Pfund’s Dairy Shop). This decorative 19th-century shop has been a Dresden institution since 1880, and offers a wide assortment of cheese and other goods. The shop is renowned for its intricate tile mosaics on the floor and walls. Altmarkt (Old Market Square). Although dominated by the nearby, unappealing, Kulturpalast (Palace of Culture), the Altmarkt is a fascinating concrete leftover from the GDR. The Gemäldegalerie Alte Meister (Gallery of Old Masters ) was built to house portions of the royal art collections. Among the priceless paintings are works by Dürer, Holbein, Jan van Eyck, Rembrandt, Rubens, van Dyck, Hals, Vermeer, Raphael, Titian, Giorgione, Veronese, Velázquez, Murillo, Canaletto, and Watteau. Albertinum. The Albertinum is named after Saxony’s King Albert, who between 1884 and 1887 converted a royal arsenal into a suitable setting for the treasures he and his forebears had collected. Deutsches Hygiene-Museum Dresden. This unique (even in a country with a national tendency for excessive cleanliness) and unfortunately named museum relates the history of public health and science. Radebeul. Radebeul is the birthplace of Germany’s well-loved novelist Karl May, who wrote popular, convincing Westerns without once visiting America. A museum here explains just how he did it. Have a beer at the Karl May Saloon, near the museum; Friday night is line-dancing night. Schloss Pillnitz (Pillnitz Palace). This romantic baroque palace, once a summer retreat for King Augustus the Strong, was built in 1720–22 and is surrounded by a landscaped garden and two smaller palaces, the Wasserpalais and the Bergpalais. Both buildings were designed in Germany’s late baroque faux-Chinese pagoda style.